Now those are some serious ruffles! Love it! This is so much cuter than seeing those patterned diapers they have today, don’t you think? I can only think of one quote that goes with this photo! Have a great weekend everyone! Love this! A girl can never have too many ruffles! Love the quote too. This one made me smile! 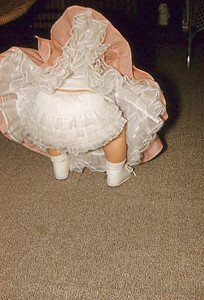 I remember well those ruffles! I had to buy them for my daughter when she was a baby. Definitely nicer than those patterned diapers. I love it!! Photo and quote are too perfect! Ditto Nelli; I could not have said it better!!!!! !